Over winter break I usually spend a good deal of time with my nephew, codename Loke, now 11 years-old. Over the past few years, I have hidden a bonus Christmas present somewhere for him and developed a puzzle that reveals its location. I began with a cryptography puzzle that involved decrypting a message using a double transposition cipher for which the key was supplied. The second year’s puzzle was called “The Bestiary” and involved chasing down references to lots of monsters in various literary traditions and using their names to spell the location of the prize. This time I created a two part puzzle: one involving a translation exercise, and the other, a classical Chinese philosophy-inspired text adventure in which the translations were required to win the game and reveal the location of his prize. 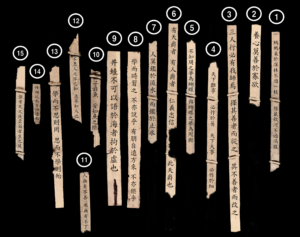 I first gave Loke a printed out image of fifteen bamboo slips with snippets from Kongzi, Mengzi, Laozi, and Zhuangzi in classical Chinese, along with a glossary tailored to these snippets. Although the Taekwondo-practicing Loke has been learning some Hangul of late, and a bit of Spanish at school, he has never studied Chinese or Classical Chinese, so it was important that even mangled translations could be used to help him in-game. I was delighted to confirm that one should never underestimate the ability of an eleven year-old to use their intuition to transform the product of a juxtaposition of matched-up characters-to-definitions into an intelligible sentence, and then, when asked, guess the philosophical message of that snippet (often not obvious in isolation) in most cases. 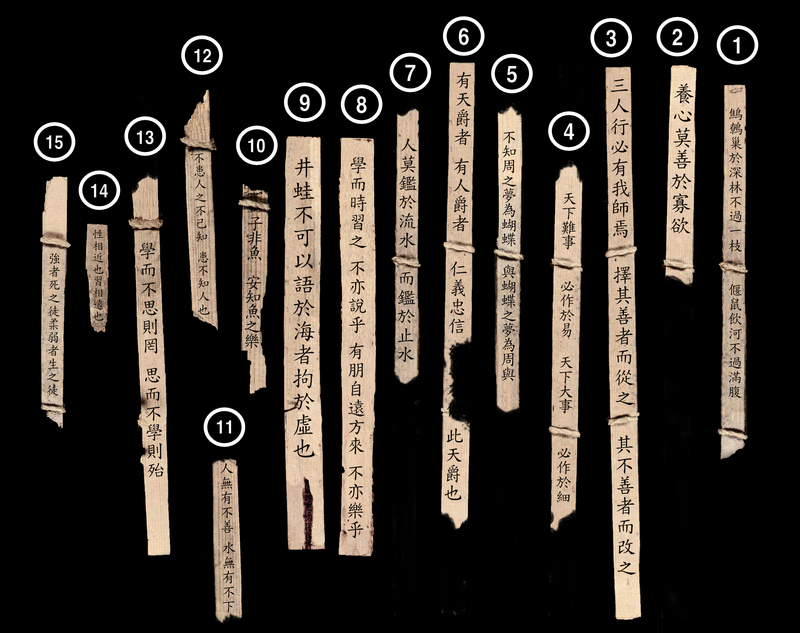 Loke translated the fifteen slips, on average 2-3 per sitting and around 15 minutes per sitting, over the course of two weeks. The inspiration for the second part of the puzzle was as a project to help teach myself the Python programming language. My code is an amateur mess but it works and it was lots of fun to recreate that nice 1980s text adventure feeling. There are a number of open source starter kits out there to help you create a text adventure game in Python. I used the lovely bwx-adventure Python module created and used by a school in San Francisco called SF Brightworks to help children create their own adventure, and modified it a bit to get it to run online in a browser through Trinket. When Loke finished his fifteen translations, I gave him a web link to his game. His goal, essentially, is to explore the game and hunt down his fifteen quotes within it on signs, scrolls, and rock carvings found in the locations of the game. When he finds a match, he makes a note of a letter found with each quote. If he can find his way past various challenges to a special “machine room,” guarded by a tomb demon, he can input the code into the machine and it will spit out the location of his prize in the real world. Loke has, as of this posting, explored about half the game, and identified about half of his translated quotes (along with a few misidentifications, which I hope he will spot when he finds the proper matches). As with puzzles in previous years, he has moments of excitement and enthusiasm for the puzzle, after which he puts it down only to return days, weeks, or months later. I was certainly no different at his age, and I can’t pretend my text adventure can compare to the lure of his joys in Minecraft (I decided not to develop the game in Minecraft, despite lots of great options for this, partly because I don’t think he would not be able to resist the urge to beautify the horribly newb work of his ancient uncle). As he explores the game Loke is encountering lots of other quotes from the Chinese classics (citations for the translations used can be access by typing “about” in the game or also here), and while wandering through the domains of Kongzi (Confucius), Mengzi (Mencius), Zhuangzi, and Loazi, he has the opportunity to meet and talk to a range of interesting characters in addition to the main four, including but not limited to Mengzi’s mother, Ban Zhao, Mozi, Huizi, the Robber Zhi in monkey form (who will steal your stuff), a giant tortoise, a cook named Meng Shen, Jesus (who can be found hanging out with the Daoists), and a frog (take a stab at where it can be found).